Last month, but first I have seen it and right on. Years ago while writing for Neithercorp Press I penned an article entitled “One Day Soon, We’ll All Be Homegrown Terrorists”. In that piece I described a not so far off future in which martial law, economic collapse, and the destruction of civil liberties stood imminent. I related my views on the propaganda rhetoric of the SPLC, and how they were using false association to tie liberty groups to any deviant organization they could think of, including racists and domestic terrorists, in order to condition the American public to react to our message with immediate contempt. It became clear to me then that the SPLC, which had become the propaganda wing of the widely reviled Department Of Homeland Security, was helping set the stage for a paradigm shift in the U.S. This shift would obviously include economic and social disruption, as well as political turmoil beyond anything our nation has seen for over 150 years. But most importantly, it would pave the way for certain elements of the American populace, namely those who are awake, aware, and outspoken, to be labeled “enemy combatants” dangerous to the state. Though posing as an anti-racist monitoring institution, the SPLC’s primary concern has never been the KKK or “White Identity”. Rather, the SPLC’s job has been and always will be to marginalize and defame those who stand against centralized federal power, regardless of how corrupt that power has become. They are not anti-racists, or liberals, or concerned citizens; they are STATISTS, who only care about maintaining the superiority of a government that has been bought and paid for many times over by a gaggle of international financiers with delusions of godhood. The SPLC, of course, has so far utterly failed in their efforts to stop the rise of Constitutional activists. By their own admission, “patriot groups” have expanded exponentially since 2008, and continue to develop freely even in the face of wildly absurd character attacks taken from the amoral (immoral) guidebook of Saul Alinsky himself. The truth, once realized, is difficult if not impossible to stop. I have said for years and years, evil only understands the muzzle end of a rifle, or brute force. You cannot reason with evil as it has no commonsense or sense. It may have knowledge but it can't use it wisely. You cannot eve rationalize or compromise with evil because evil is chaos itself. When a people lets evil govern them, then everything and everyone concerned is corrupted, the system fails and tyranny ensues. I have also stated that in reality you have no choice in the matter concerning the evil in government today. Either you address with the necessary force to correct the problem or be prepared to become fully enslaved. Fore you cannot reason with those people today. You have no choice but to force them out because evil will NEVER EVER relinquish power of their own accord. They simply don't have the sense too! I am all but done pleading and, talking and writing. I cannot and will not Marta myself as a one man cause, fore it would not make any difference for any one person at this point in history. It must be a group effort for good to try and right the wrongs of the evil that controls the government. Forget politics, it's only a charade buying them time to more fully implement their agenda. Forget the courts or any forms of redress of grievances as all avenues of redress of grievances is dead. The devil only understands ONE thing and he trying as hard as he can to pull those teeth you have left. BTW-- Forgive me not proofing my previous post, nor many others I write you. I found many minor mistakes all though it.... While I'm not very adept at English, I can do better than what I posted earlier. Matter of fact I just caught a mistake in my last statement that you quoted. It should read: There NEVER was and NEVER EVER will be an honest compromise. I detest them more than any organization that I know of in these United States. John C Calhoun makes me puffeth up and smile! Honored to be in the presence of such good company! I'm curious about what it's going to be like in North Carolina when you free it after the battles and all. I guess it will be like it was after the Revolutionary War. Everyone well armed of course and democracy and freedom will ring. I wonder if you'll be allowed to keep black people as slaves again? Just curious. I wonder if you'll be allowed to keep black people as slaves again? Just curious. Oh they missed the boat with their statement! "Everyone well armed of course and democracy and freedom will ring." Actually, that quote belongs to the Marxist, Communists and liberals, who are in reality Humanists. You know, those people who call themselves Democrats in this country. Plus many RINO Republicans refers to the same statement, George Bush being just one. To answer that statement and question. NO, Democracy and Freedom will NOT ring here or in any other state that frees itself from your federal tyranny. There will never again be another Democracy when the world frees itself from this one. Accordingly this will also mean an end to YOUR version of how YOU refer to Freedom. Fore how YOU refer to Democracy and Freedom is a far different thing than how it was originally meant. That is why under the US Constitution the united States was originally a Republic. But now under your control, and through Abraham Lincoln's War, you have turned this Republic into a DEMOCRACY! As for your last question, "I wonder if you'll be allowed to keep black people as slaves again? Just curious." I'll also answer that. 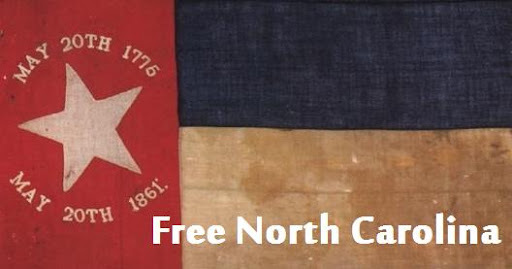 Actually if North Carolina or any state does free itself from this federal tyranny it will NOT mean, if we will keep black people as slaves or any people, but rather it will mean that we in those states have FREED ourselves from being your slaves and *supporting* YOU and your cronies with our money, blood and lives! That being the same thing as slavery only in a more modern sense and context... So, we are fighting tooth and nail to free ourselves from YOU and your kind, and NOT to acquire anyone. U refer to Democracy and Freedom is a far different thing than how it was originally meant. That is why under the US Constitution the united States was originally a Republic. But now under your control, and through Abraham Lincoln's War, you have turned this Republic into a DEMOCRACY! A lot of these lefty organizations are funded with Saudi money. CAIR and endless numbers of Wash DC "think tanks" like Dhimini Grover Norquist helping Rubio push amnesty. CAIR is Saudi Arabia an dtheir mission is to build mosques and flood America with Muslims. Matt Damon comes out with an anti-fracking movie and the United Arab Emirates funded the movie which died at the box office. SPLC probably gets money fromn the Saudis and Soros.